Present state: Demolished. Site partly redeveloped. Notes: Didsbury station opened on 1st January 1880 as part of the Manchester South District Railway that connected Manchester Central to Stockport Tiviot Dale. the line would make a connection with the Cheshire Lines Railway’s (CLC) route between Woodley and Skelton Junction at Heaton Mersey. However, despite obtaining the Act, the MDSR was unable to start work on the construction of the line due to financial difficulties. At this point the CLC became interested in purchasing the MDSR as they saw value in the projected route to Manchester. Unfortunately one of the CLC partners, the Great Northern Railway (GNR), did not see any value in the route, so the CLC was not able to proceed with its idea. The other two CLC partners, the Manchester, Sheffield, & Lincolnshire Railway (MSLR) and the Midland Railway (MR), decided to press ahead and purchase the MSDR. The MR in particular wanted a route of its own into Manchester so that it was not beholden to other companies. Since 1867 its train services from the south had had to use Manchester London Road Station which was a joint London and North Western Railway (LNWR) and MSLR station. A bill was granted by Parliament on 11th August 1876 which authorised the MR and MSLR to take over the MSDR and build the line from Heaton Mersey to Manchester. Within a month of the Act being signed the MSLR got cold feet and decided that they did not want to proceed. The MR was desperate to create a route of its own to Manchester. To make matters worse it had been given notice to quit operating to London Road Station. The MR went back to Parliament, and on 12th July 1877 they were given authority to take over the MSDR and build the line. Work began on the line in 1878. Didsbury was to be the third intermediate station from Manchester on the new line. It was close to the centre of Didsbury which, in 1880, was becoming a thriving suburb of Manchester. 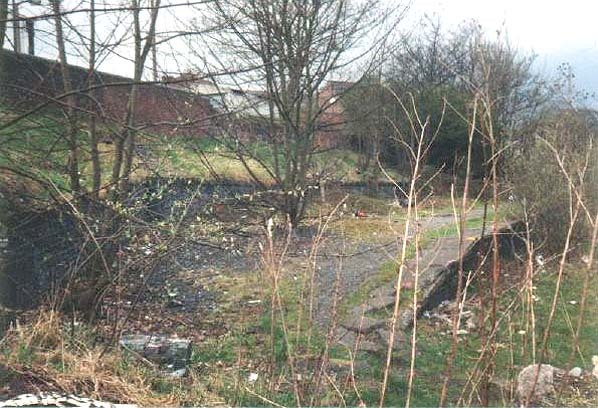 The station was located in a cutting on the east side of the Wilmslow Road. The main station building was located at street level adjacent to the northbound (Manchester Direction) platform. The building was set back from the road by a few metres which allowed space for a lay-over area, constructed from stone sets, for cabs and delivery vehicles. entrance. Facilities included a booking office, station master’s office, lamp room, coal store, ladies’ and gentlemen’s waiting rooms and toilets. Interestingly the main station building also had stable facilities and a harness room. This provision reflected the station’s importance to the Didsbury area, as there would be many deliveries going out and coming in. From the main station building a covered footbridge connected to two platforms. As already stated the building was adjacent to the northbound platform, and two sets of steps, one from each side of the footbridge, provided access to it. 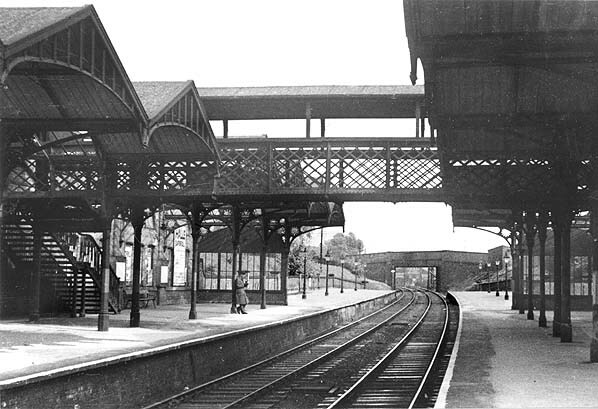 A canopy that ran for the length of the building and extended out slightly beyond the platform edge gave passengers protection from the weather. On the southbound platform (Stockport Direction) two sets of steps also connected to the footbridge in a mirror image of those on the other side of the line. There was also a canopy on the southbound platform. Didsbury Station was provided with long platforms, as it was expected from the very beginning that express services would call. Southeast of the passenger station goods facilities were provided which included a goods shed, a public weighbridge, numerous sidings and a 5 ton crane. without the need to use lines not under its control. From August 1880 the MR started to run express trains between Manchester Central and London St Pancras via the South District line and many of these express trains called at Didsbury due to its importance. By 1900 over 200,000 passenger bookings per year were being made at Didsbury, and the South District train service was running at a ten minute frequency during the busy day time periods. On 1st October 1901 the MR opened part of a new line between Heaton Mersey and New Mills, and from this date half of the South District train services began to run to a new station at Cheadle Heath. The new line was built to provide a faster route to the south for express services. Cheadle Heath was an interchange station where passengers could transfer between long distance and local trains. Express services were using the new route by July 1902. By 1910 Didsbury was being served by thirty eight trains running towards the south and forty one running north. At this time passengers could travel from Didsbury not only to local stations on the line but to distant destinations such as London St Pancras, Derby and Sheffield. The Great War led to a reduction in services, but by 1922 things had started to return to normal. In 1923 Didsbury station became part of the London Midland and Scottish Railway, and by 1939 it was being served by forty trains in each direction. These included two weekday morning express services that ran to London in just four hours. Special trains also operated on Sundays during the 1930s. These included an 08.48 and a 09.02 hikers’ special which ran to Chinley giving local pople access to the Peak District. During the Second World War regular passenger services were once again reduced and, although they recovered very gradually after the war, they never recovered to the levels of the 1930s. four to Manchester Central. By 1956 the service had been reduced even further to sixteen trains a day in each direction. There was no reduction in express services though, and from 1958 work began on the electrification of the former LNWR route from Manchester to London which resulted in even more express passenger traffic being routed along the former MR line. In 1960 British Railways began operating the ‘Blue Pullman’ service between Manchester Central and London St Pancras. The service, however, did not call at Didsbury as it was scheduled to make only one stop on its journey, and Cheadle Heath was chosen as the more suitable point for it to call. Early in 1961 Diesel Multiple Units (DMUs) were introduced onto the South District locals. In 1964 there were only thirteen services towards Stockport or Cheadle Heath and twelve towards Manchester Central. Longer distance services to Buxton, Sheffield and Derby continued to call. In 1966 electrification of the LNWR line was completed. British Railways started to route most of its Manchester to London services over this route. Even the Blue Pullman service was discontinued as it was replaced by a new electric Pullman service that ran from Manchester Piccadilly. 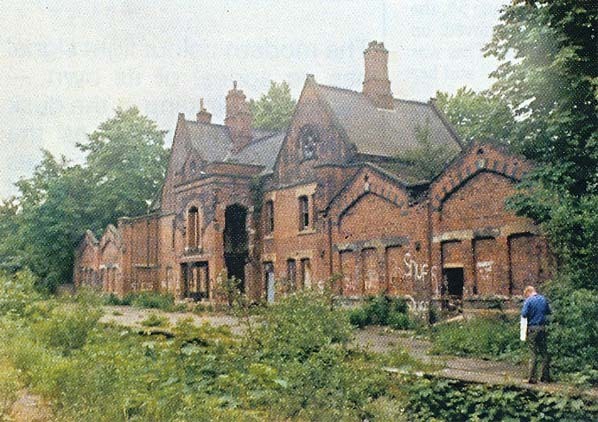 The goods yard closed on 2nd November 1964 and Didsbury Station was earmarked for closure. The last South District local services operated until 1st January 1967. The very last train to call at Didsbury was the 18:45 Manchester Central to London St Pancras service. Didsbury station was closed with effect from 2nd January 1967.
the summer of 1969, but on 17th August the line was disconnected at Chorlton Junction. It was lifted in 1970. 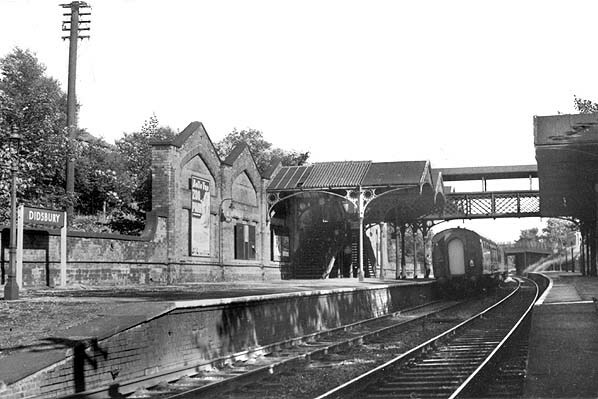 The Station buildings survived until 1981 when they were demolished and replaced by a small shopping precinct. The clock which stood in front of the station was restored and still stands today. 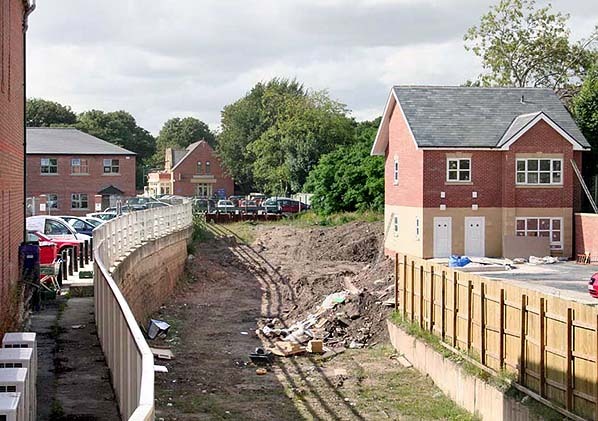 Although much of the station site has been built over in the years following its closure, part of the trackbed has been preserved as there are plans to construct a future extension of the Manchester Metrolink Tramway along the route of the MR South District line through Didsbury. Other web sites: Peak Rail now providing a regular steam service between Matlock and Rowsley. David Hey's Collection - Transition from BR steam. Includes railway photographer ER Morten's photographic tour from Buxton - Derby. Eight and a half miles of the Matlock - Buxton line now forms the Monsal Trail starting at Coombs Road Viaduct, one mile southeast of Bakewell and finishing at the head of Chee Dale, about three miles east of Buxton. There is a diversion round the tunnels. Further reading: Railway from Buxton to Bakewell, Matlock and Ambergate (Scenes from the Past) by JM Bentley, 1992. Railways around Buxton by JM Bentley, 1987. Matlock Riverside PEAK RAIL & Matlock STILL OPEN. 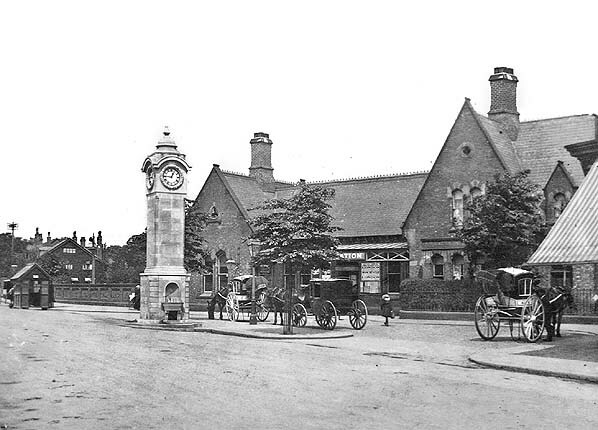 Didsbury station forecourt in 1895. Cabs and carriages wait to pick up custom from passengers arriving at the station. Looking south from the northbound platform at Didsbury Station in 1946. A solitary passenger waits for a southbound train. 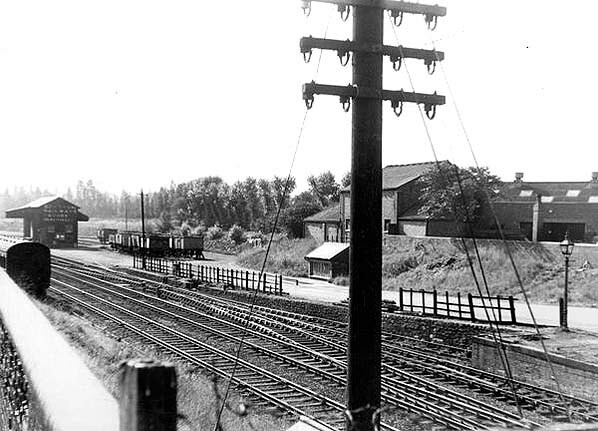 Looking south at Didsbury's goods facilies in 1959. Looking south at Didsbury Station in 1966 as a southbound train pulls away from the station. The photographer is standing at the north end of the northbound platform and the view shows clearly the arangements on the southbound platform. The steps that lead down in both directions from the footbridge are clearly shown as is the station's large canopy. 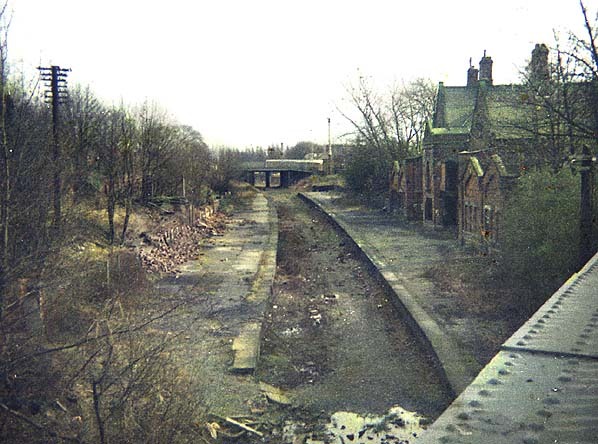 Looking southeast at Didsbury station in 1978. Despite being closed for over a decade much could still be seen of the station at this date. Both platforms were extant. future use by Metrolink trams. 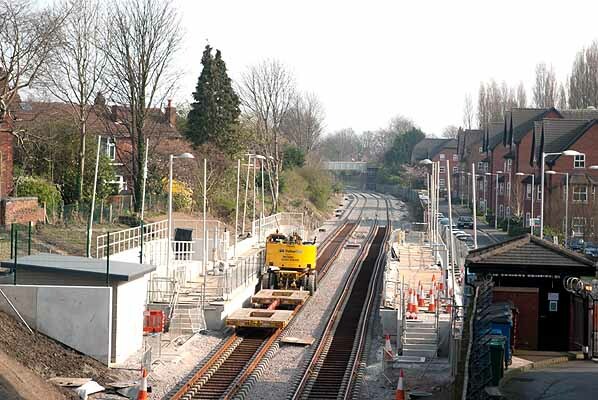 The site od Didsbury station looking south-east towards East Didsbury on 24 March 2012 during construction of the Merolink tram line.